Boing-Boing has a short blurb on a Munson typewriter recently added to the Martin Howard Typewriter Collection. I find it interesting to see these different early mechanical design that ran rampant before the turn of the 20th century. Seeing those familiar octagonal shaped keys from my own Oliver 9, I wonder if the Munson's keys were really like that or if this was a rebuild. I'm thinking the latter, but I am sure someone around here with more knowledge on these earlier typewriters can correct me. 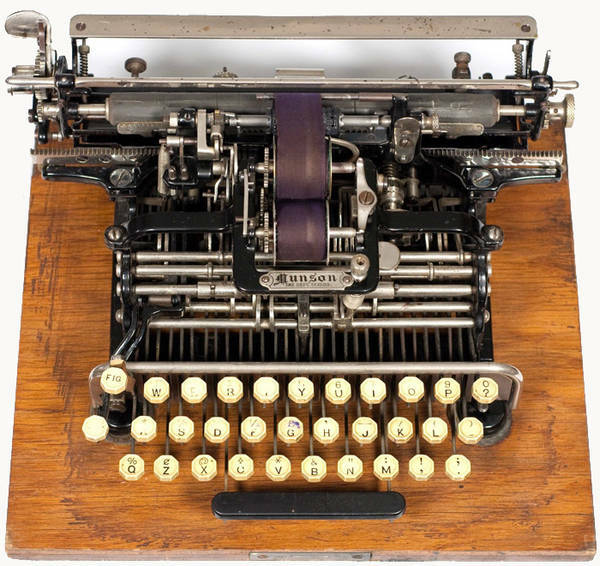 I don't have a Munson, but many early typewriters used octagonal keys. One very nice looking typewriter!